At least the current pope, Papa Francesco, does not sleep in the Apostolic Palace of Castel Gandolfo. He has abnegated the luxury of a vacation residence and opened the doors to the public; At least to anyone willing to pay €10.00 for entrance. 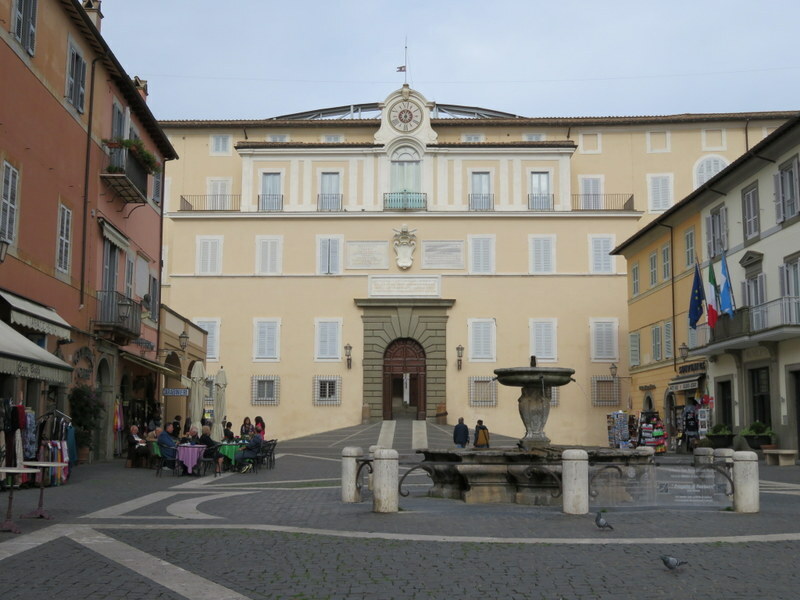 The Apostolic Palace dominates the square in Castel Gandolfo. In September we visited the Gardens of the Pontifical Villa, thinking we were in Castel Gandolfo. In actuality, the gardens are part of Villa Barberini in Albano Laziale and when we exited the garden tour we were a long walk from the little town of Castel Gandolfo. So we vowed to return while the weather was good. Pope’s view of Lago Albano. Early in the morning the flow of commuters from small towns storm Stazione Termini like an invading horde. The incoming trains are packed with briefcase-toting-suit-wearers and women tottering on impossibly high heels, and it seems everyone is puffing on a post-commute cigarette. We were blessed with an out-of-Roma trip, against the onrush of workers, accompanied by a very few Romans who actually get to leave the city for work. 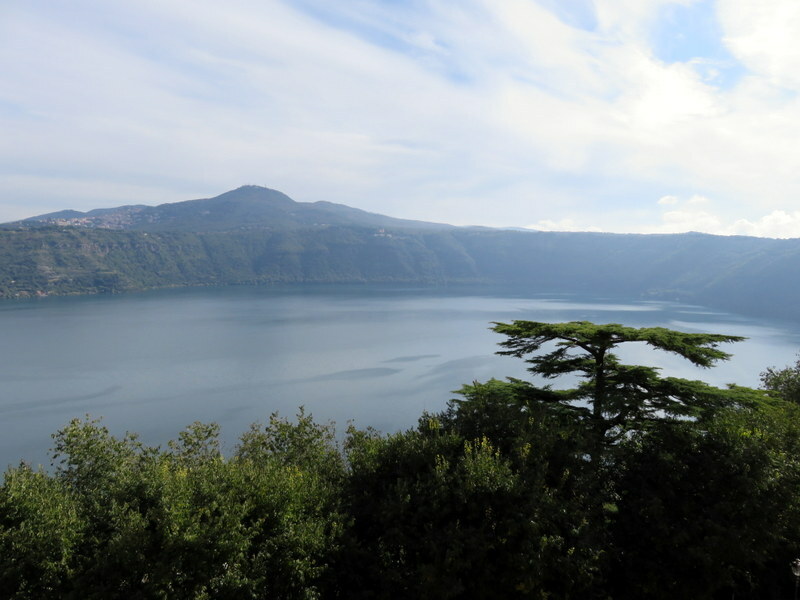 A quick 40-minute ride through the countryside, passing Ciampino Airport and a handful of small towns, brought us to Castel Gandolfo. Then a 15-minute slog walk up the hill landed us in the town square where any number of little bars awaited our arrival. We found seats and a cappuccino in the 15-degree Celsius sunshine with a full view of the Apostolic Palace, aka, Papal Palace, aka Pontifical Villa or most commonly in Italian Palazzo Apostolico. Take your pick. 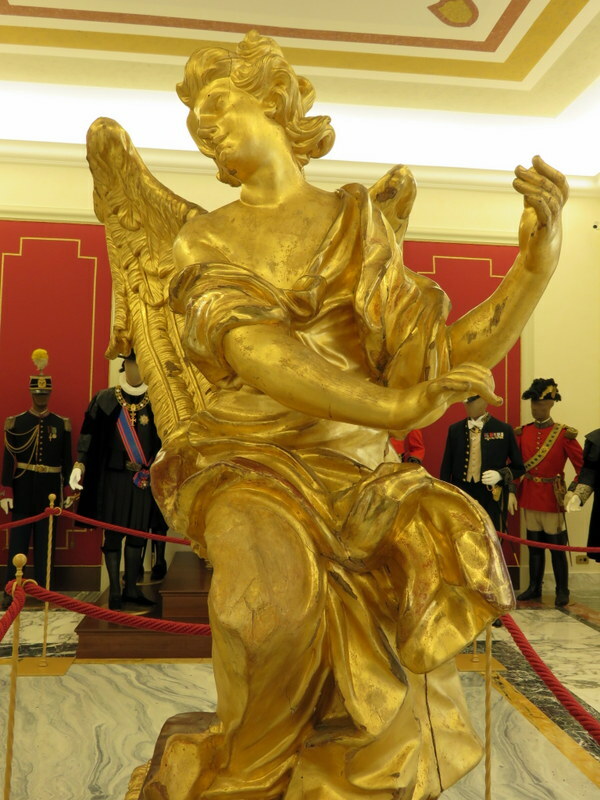 A Bernini angel…at least the audio guide claims it is his work. Writing set of Pope Pius VIII. Sorry about the glare. It is under glass for its protection. As instructed, 20 minutes before our tour time of 10:00, we approached the guard who welcomed us warmly and sent us up a flight of stairs to enter the museum. We were equipped with audio tour devices and sent on our way to self-guide, well before the clock chimed 10:00. We were the only people in the entire museum! Now before you get to thinking that we ran giddily through the papal vacation home, jumping on the beds and checking inside the refrigerator, the public is not allowed in any area that would be considered an apartment. 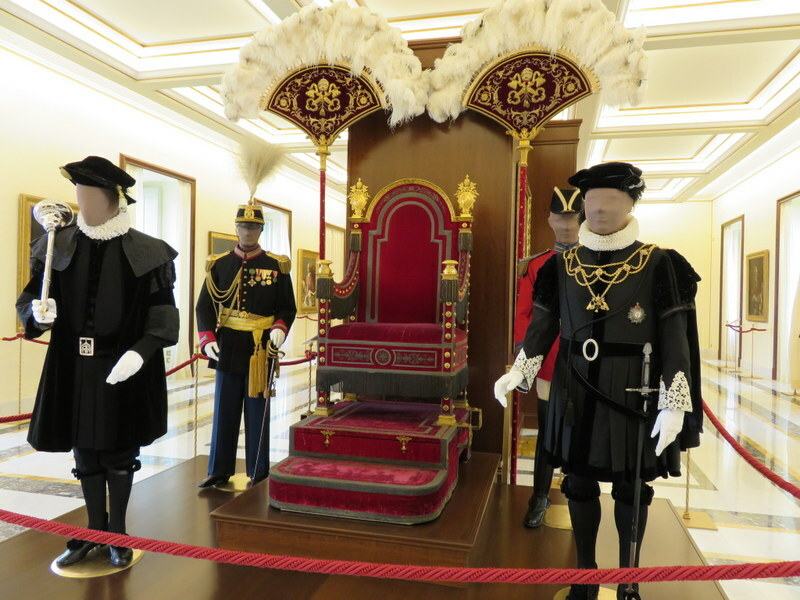 The museum consists largely of select papal portraits along with some special accoutrements, and the accompanying audio guide tells some of the fascinating history behind these powerful men. 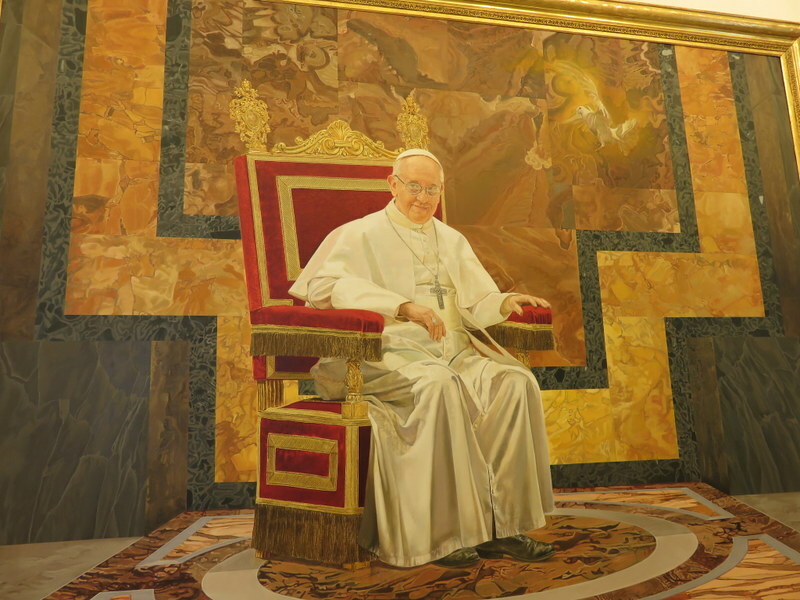 The portrait of Papa Francesco is in a very different style from his predecessors. We enjoyed the tour very much, even if we did not get to see the Papal bathroom. There’s one of those at Castel Sant’Angelo anyway. In 6 1/2 hours we went from our home to Castel Gandolfo by bus and train, had coffee (always on the agenda), took the tour, and were back home in time for lunch. If one wanted to have lunch in CG — and why not with that view of the lake! — I would actually recommend the 11:00 tour followed by a leisurely lunch. Trains back to Roma are frequent. Would I spend an entire vacation day doing this on my first trip to Roma? Absolutely no. But when you have been here as long as we have, or visit annually like some of our friends, it’s fun to find new places to explore. There are many restaurants that take advantage of the fine lake view. Info on tickets for the sites in Castel Gandolfo and Albano Laziale can be found here. 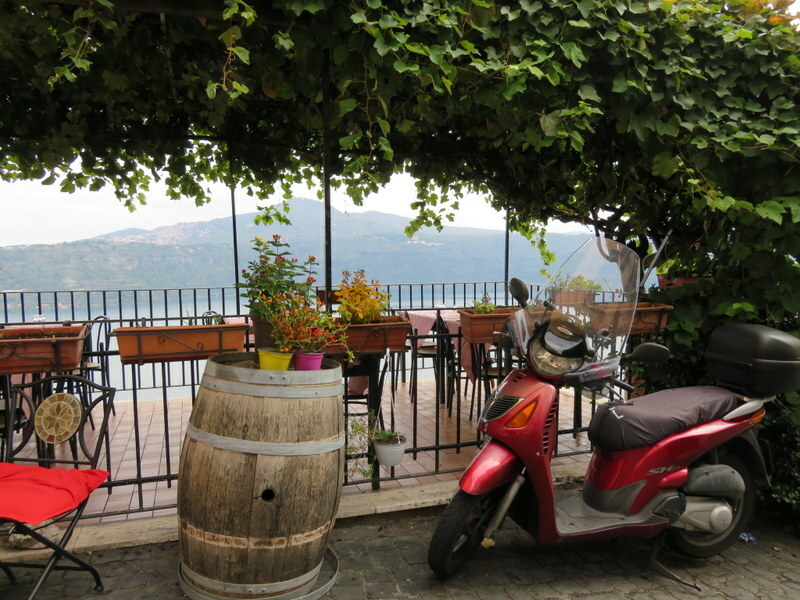 I really enjoyed your post…I’ve visited lake Albano but didn’t get up to the Pope’s residence. Thanks for stopping by! I see you’ve been “enjoying|” the heat in Rome, which we have escaped for the month of July. Good start on your blog, but I cannot figure out how to follow you. FB link just takes me to my homepage on FB. Can you put up a “Follow Me” link? I’m working on it..still trying to figure out WordPress and I’ve had a few crashes in the process. Soon I’ll have it worked out. I’ve figured the Instagram piece..yay! Lovely site btw…it inspires me! I am no expert either, but it seems to me that Bernini’s works are much more refined and better executed than that piece of statuary. What a gorgeous setting!! How charming those little towns are! Looks like retirement agrees with you. Keep me in mind for next Sept/Oct. I am ready, willing and able. I’ll be in touch by the end of the year. September is likely to include a long-ish trip to the U.K.
Is this the lake where there is a delicious fish that is served in the local restaurants or is that another lake? That really doesn’t look like a Bernini to me. What do you think? I have had some lake-specific fish at Lago di Como. Last time I ate in CG I don’t recall if they had a species in Lago Albano. I agree on the Bernini, although I am no expert. The signage said “School of Bernini” but the audio said they thought it was actually one of his. Maybe one of his less-divine works? Oh that lake view is spectacular. And that Angel Bernini is really stunning. I’m sad you didn’t get to see the Pope’s bathroom, though, or jump on his bed. Now THAT would have been quite the story! haha Keep on posting your great finds like this one. And….how DO the European women walk in those little high heals? The popes, over the years,k have certainly surrounded themselves with stunning art! Whether it is really a Bernini, it was impressive and quite large. I think those high heels catch up with them. Practically every older Roman woman has a cane and can barely walk. If I wore 4″ heels on these streets I’d end up with a broken ankle or worse! I love that you have seen the Papal bathroom and therefore do not need to review another. A reminder that the Pope is human, after all, and walks to that particular throne as the rest of us do. I suspect there was not a bidet, but I could be wrong. 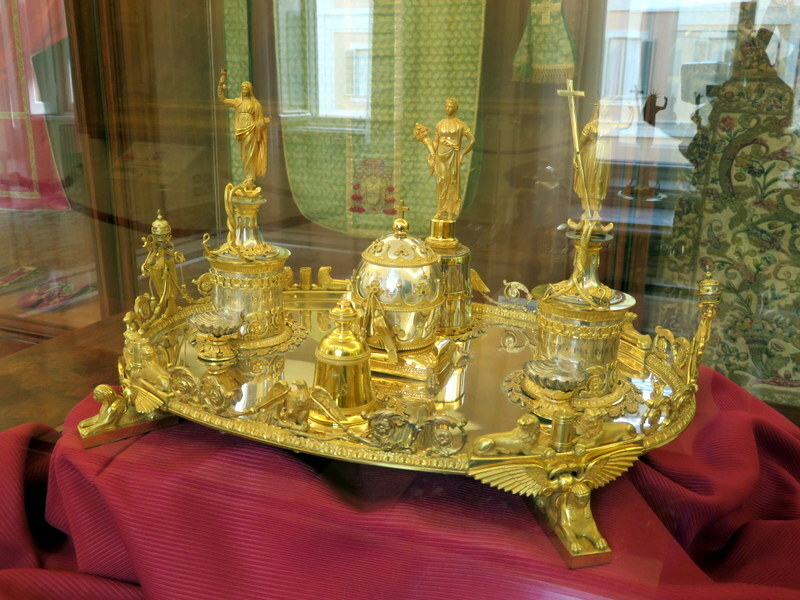 The whole topic is quite interesting – does the bathtub have gold fixtures? REAL gold fixtures? This could lead down a long rabbit hole of surmises – like is the porcelain for the tub and potty only allowed to dug up before it is fired at a specially location on the banks of a special river, where they have been digging up porcelain clay for centuries – and to be fired in a kiln that is blessed by a certain papal envoy. What about the water heater? What do you suppose a papal water heater looks like? OK, I am stopping. Sounds like you are having a great time and that alone is good to hear. What a fun post this was – thanks for sharing. It was such a pleasure to have the place to ourselves!